When learning how to clean a wound, it is important to forget about the things you used to do so far for treating it. You’d be surprised how wrong they were. The first thing that comes to mind when you think about how to clean a wound is the placement of any type of bandage or tourniquet that prevents bleeding. However, it can be a big mistake. To ensure the proper healing of a wound and avoid infections that may lead to other health damage, several factors must be considered. To act at the right moment you must avoid a series of things when dealing with a wound. The skin is the largest organ in the human body and protects the body from viruses, bacteria and fungi. When the skin is damaged, the risk of these parasites penetrating and attacking other organs is present. Also, the deeper, bigger or dirtier the wound is, the more care you will need. When it comes to treating a wound there are some things you should avoid. The placement of tight bandages or tourniquets to stop bleeding is a serious mistake, since it can cause necrosis in the limb. Nor should the wound be cauterized or burned. 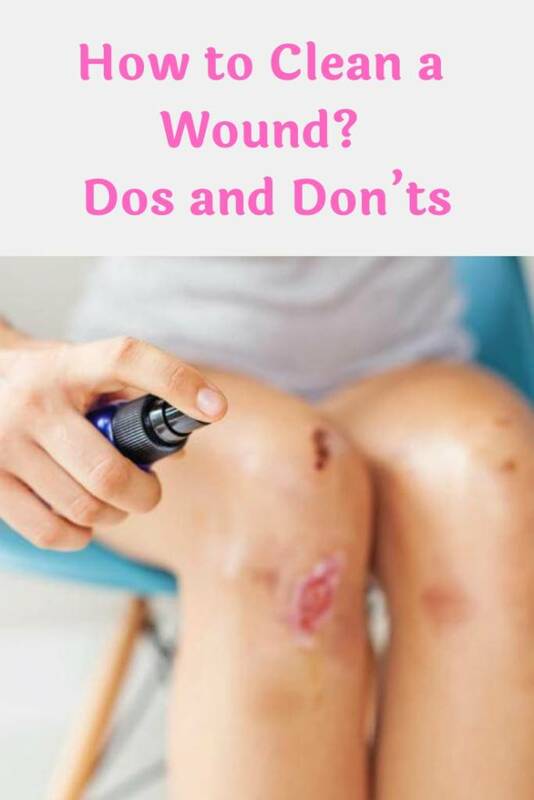 Learn how to treat a wound by reading about the dos and don’ts. The use of cotton has the drawback of the fibers that it gives off, which could cause damage if the wound closes with these inside. It is also not positive to use alcohol or products based on mercurochrome; They are irritating and some have vasodilating effects. The most advisable would be to apply specific gauzes, which do not release fibers and reduce the risks of cotton. In addition, it is more convenient to use antiseptics such as povidone-iodine (Betadine®) or chlorhexidine solutions. Although both have a high antiseptic power, povidone is inactivated with biological fluids. In case of suppuration or blood it is more advisable to use chlorhexidine. Do not rub the wound to clean it or remove foreign objects, such as dirty, glass, wood or iron. If these objects are large they may be blocking the bleeding; this is a procedure that we must leave to the doctors. Nor should you delay the medical examination, especially if it involves large and deep wounds. Wounds caused by human or animal bites and those caused by sharp objects should not be neglected. Maybe they need the application of vaccines against tetanus or rabies. A proper procedure will prevent subsequent infection and improve healing. The first thing is to clean the hands of those who will help in healing to avoid infections. The next step would be to clean the wound with tap water, hydrogen peroxide or physiological solution. Avoiding contact with blood will minimize the chances of infection. The next thing will be to dry the surrounding skin, avoiding touching the wound. If we have an antiseptic it is time to use it, cleaning in circles from the inside out. We cover with gauze and a tape or adhesive to protect the damaged skin. If there is hemorrhage, it is essential to stop it. With the hand, we will press with a gauze or a clean cloth that does not leave remains; when the outbreak stops, the wound must be covered. The time to receive medical attention should not exceed six hours. This will avoid subsequent complications, such as poor healing or infections. How to clean a wound in children? In the case of small wounds in children it is recommended to wash them with tap water (running water) to clean the dirt; if you have physiological saline or oxygenated water, even better. You can use a mild soap. You have to dry the wound without rubbing it, with small touches from the inside out. An antiseptic will be applied and covered with sterile gauze and tape; the process must be repeated periodically. When the scab appears, it will not be necessary to continue the healing. If the wound is large and the bleeding profuse, we will raise the part of the body so that it is higher than the heart. We will not apply tourniquets or check the wound. If there are clots in the gauze, we will leave them. If that gauze has been soaked with blood we will put another one on top, but we will not remove the first one. At first the lesion may be inflamed and red, which shows the work of the immune system to prevent infections. When the scab appears, the ideal is to apply protective mechanism while forming a new tissue and wait for it to dry. If the wound does not stop bleeding or if it does intermittently it is necessary to mobilize. When there are strange objects, and more if they are large, it is necessary to go to a health center. A large and deep wound should also be treated by specialists. Neck, joint, genital or face injuries should be evaluated by a doctor. The first are functional areas and the face is aesthetic care. When the wound involves the detachment of an organ it is urgent to go to the healthcare center. The separated part should be carried, preferably in a container with ice. If the blood that sprouts is darker and pulses out, it is arterial blood. It is a case of extreme seriousness, which requires a quick trip to the hospital. These considerations when treating a wound are of vital importance. The knowledge and information to address them can make the difference between a successful cure and complications. Don’t forget to SHARE how to clean a wound with your friends and family on your social networks!